1987 BSc. Biology, University of Louisiana at Monroe. 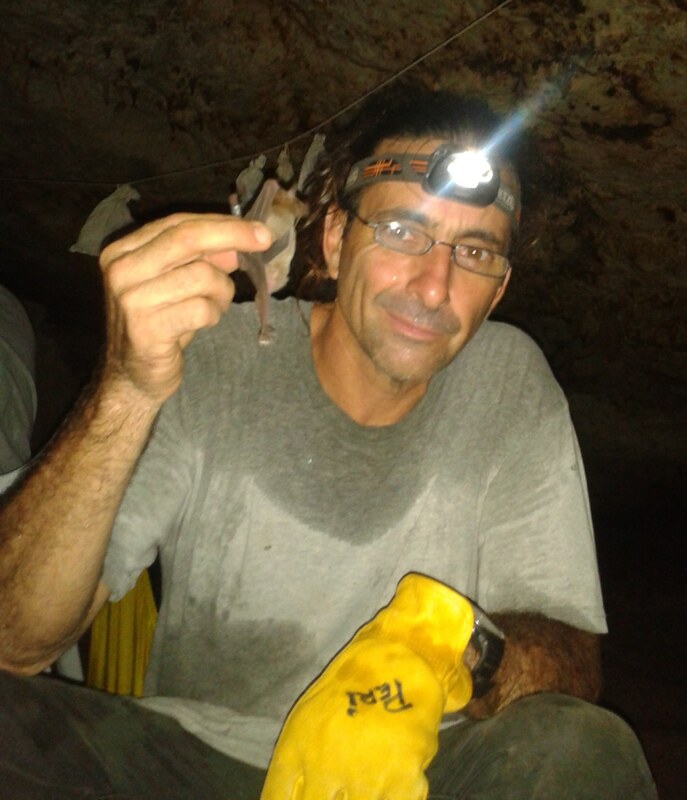 For the last 7 years and in close cooperation with the nature management organizations of Aruba, Bonaire and Curaçao, I have been conducting simultaneous research on the roost use dynamics of the cave-dwelling bats of the ABC islands, the population dynamics of the Curaçaoan Long-nosed bat (Leptonycteris curasoae) and conducting a cave mapping project that aims to include all caves found in the ABC Islands. With the results I aim to substantiate the legal implementation of Cave System Nature Reserves on each one of the ABC Islands, or a trans boundary nature reserve for the 3 islands. Classified as “vulnerable” and with a decreasing population according to IUCN’s red list, the Long-nosed bat is a keystone species for the dry terrestrial ecosystems of the 3 islands and a large portion of the northern region of South America including Venezuela and Colombia. This species is highly dependent on a small and very specific number of caves (<5) on each island. Caves are threatened by vandalism and maternity colonies are extremely vulnerable. With a long-term mark and recapture project in which approximately 7000 bats were banded on the 3 islands and Venezuela, we demonstrated the island-island and island-mainland movements of this species. This finding has major implications for the management and protection of the species and clearly illustrates that only with coordinating efforts on the ABC islands, Venezuela and Colombia we can ensure a viable population of the species. Geographical isolation and small population size increase the risk of extinction of psittacids on islands. The yellow-shouldered parrot (Amazona barbadensis rothschildi) is a well-established endemic subspecies for the island of Bonaire classified as “vulnerable” and with a very small and decreasing world population according to IUCN’s red list. This species is under several threats like prolonged dry periods, poaching, predation, and habitat loss. Therefore long-term research and monitoring should be a priority for local organizations responsible for wildlife management and conservation. Existing estimates of population size were based on incomplete roost-count data not adjusted for detection probability. Unadjusted counts confound abundance and detection and do not provide valid estimates of population size or rate of change. Motivated by the lack of adequate count data for estimating its population, I conducted surveys in 2010, 2011 and 2012 using a combination of standard and multiple-covariate distance sampling, repetitive counts and time-removal method to serve as a appropriate baseline to design and establish a monitoring program to assess population status and trends to promote informed management decisions and actions. We plan to carry out this survey in 2015 to have a better view of the trends before submitting the publication. Arctic-nesting shorebirds have shown serious declines. The State of Canada’s Birds – 2012 reported that arctic shorebird populations have declined by 60%. The Caribbean Region is a very important area for North American shorebirds. Many species pass through the area, and individuals of some species may spend the entire winter in the Caribbean. Strategies indicate that there is a need to identify these threats and to increase involvement in monitoring shorebirds on the wintering grounds. In general, there is a lack of information and for some species their wintering ranges and habitat use are poorly known. Therefore, the integration of research and monitoring should become a priority for the local organizations in the Caribbean responsible for the management and conservation of migratory bird populations and habitats. In 2008 I started a monitoring program for aquatic and shorebirds that inhabit the salt-flats of Bonaire, 2 of them Ramsar sites. Since then, international NGO’s, Canada Environment and the USFWS have been providing assistance in different ways aiming to enlarge this monitoring program to include the salt facility production in the South of Bonaire and the islands of Curacao and Aruba. As a result, in 2015 a bird-monitoring workshop with participants from all the Dutch Caribbean was held at CARMABI. Ramón de León, Kim Vane, Paulo Bertuol, Valérie C. Chamberland, Fernando Simal, Eseld Imms, Mark J. A. Vermeij, 2013. Effectiveness of lionfish removal efforts in the southern Caribbean. Endangered Species Research. Vol. 22: 175–182, 2013doi: 10.3354/esr00542.